Widely used conventional plastics have many advantages; however, their resistance to biological agents have a negative impact on the environment. Therefore, the use of (bio)degradable polymers should become widespread owing to growing interest in sustainability, organic recycling, and environmental issues. This review focuses on compostable polymeric ecomaterials with potential applications in many fields of modern society. The waste management strategy and regulations for polymeric ecomaterials, methods of evaluating the composting process, the biodegradability of polymers, in addition to the basics of composting processes are presented. The most important (bio)degradable polymer applications are discussed with regard to renewable recourses, (bio)degradability, and recycling. Widely used conventional polymers have many advantages; however, their resistance to biological agents cause plastic products at the end of their life cycle to be a significant burden on the environment. In comparison with classical materials, ecomaterials (materials that enhance environmental improvement) should possess at least one environmentally friendly factor that has no effect on performance. Ecofriendly materials are defined as products (or services) that have been designed to minimize environmental damage (have a reduced effect on human health and the environment) compared with competing products or services that serve the same purpose. A wide range of ecomaterials has been developed in various industries. These materials must meet only a few requirements regarding resource, manufacturing process or recycling. Among them, polymers are an important group . Polymeric ecomaterials (ecofriendly or environmentally friendly polymeric materials ) are characterized by recyclability (reuse, recycling or biodegradation), being lightweight, energy efficiency, and reduction of pollution and material use (Fig. 1). Ecofriendly materials can derive not only from renewable resources, but also from the reuse of waste (salvaged products or recycled materials) or petrochemical resources. Material can also be environmentally friendly by itself, such as cellulose (natural polymer) [2, 3]. Recycling is the process of converting (recovery and reprocess) collected waste including plastics into a substance, material or product that becomes reusable . Composting is a natural process carried out under aerobic or anaerobic conditions. In this process, various microorganisms, including bacteria and fungi, break down organic matter into simpler substances (humus, water, carbon dioxide, and heat, or under anaerobic conditions methane). Organic recycling is biological decomposition under controlled conditions of waste into compost as a product. Originally, it was used on a small scale in gardens or farms and in many European countries has a long history. In the last 20 years, interest in composting process as a method of waste utilization is much revived, particularly with regard to the problem of reducing plastic waste going to landfill. Compost production is also an opportunity to provide a product that can be used in agriculture as fertilizer or soil conditioner. Compostability is a feature that makes the material less burdensome to the environment . Over the last few years, significant progress has been made in the range of polymeric ecomaterials commercially available and under development. Technological progress and the possibility of the safer production of these materials, together with consumer demand for ecoproducts, force the development of new strategies for the replacement of petrochemical feedstocks by renewable resources . However, bio-based polymers currently account for less than 3% of total polymer production. The implementation of the transformation process from traditional plastics to ecomaterials involves many scientific and technological uncertainties and still requires many complex activities before there is full acceptance of such materials in daily life, especially in the area of wider cooperation among the producer, material suppliers, and research and development (R&D) institutes, and the need to develop the management and delivery sectors. Compostable ecomaterials undergo controlled biological decomposition into safe and environmentally friendly products for human life and health, in contrast to conventional polymer waste, which is deposited into landfills and pollutes the surrounding environment. They also do not require additional segregation and separation from the household’s organic waste and could be subjected to organic recycling along with organic contaminants from food. Considering the above, it is equally important to develop research, technology, and increase the awareness of end-users. The key behind the life cycle of polymer ecomaterials is to optimize the use of the limited global resources by avoiding unnecessary waste generation [6, 7, 8, 9, 10, 11]. 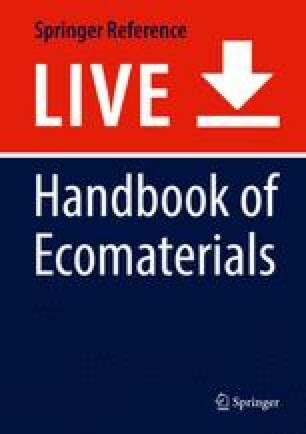 This review focuses on the waste management strategy and regulations for polymeric ecomaterials, methods for evaluating the composting process and biodegradability of polymers, in addition to the basics of the composting processes. Furthermore, compostable polymeric materials with approved or potential applications in many fields of modern society are presented. The most important (bio)degradable polymer applications are discussed based on studies reported in the literature along with future trends. The bio-based and/or (bio)degradable polymer market is a relatively new market that covers an increasing number of products so far made from conventional non-biodegradable plastics. However, the production and consumption of conventional plastics is still high and increases significantly year by year (Fig. 2). In the developed countries, 100 kg of plastic are consumed by one person each year (Fig. 3). In Asia, this number is much lower (about 20 kg/per person), but it is growing very fast . In Europe, after a downturn in the market share in 2009, the production of plastic has currently reached a level similar to that in 2002. Most demand for plastic in Europe comes from five countries: Germany (25.4%), Italy (14.3%), France (9.7%), UK (7.6%), and Spain (7.5%). The plastics industry is one of the fastest growing industries. A wide variety of types of plastic are obtained to meet the requirements for the production of different plastic products. Figure 4 presents the demand for plastic in Europe in 2013 [14, 15]. Almost 40% of total European demand is consumed by packaging applications. Low-density polyethylene (LDPE), linear low-density polyethylene (LLDPE), and poly(ethylene terephthalate) (PET) are the most popular polymers in the packaging industry . Mainly shopping bags and bottles are produced from these materials . Plastic bags and bottles have become one of the major solid waste streams . Most packaging belongs to short-life products, and because conventional plastics do not degrade easily in nature, the problems with these materials after use have become significant . Waste is mainly produced by economic activities and households. A total of 2,598 million tonnes of waste were generated in the European Union (EU) in 2014. There are significant differences in the amount of waste generation in EU member states. These numbers relate to the economic size of the country and the population (Fig. 5) . In 2014, the average amount of waste generated in the European Union was 5,118 kg/person; thus, a significant amount of waste requires proper treatment . The EU is focused on the reduction impacts of waste on the environment and on health. The waste management policy is directed at 3R society (reduction, recycling, reuse). Sustainable growth of European economies is strictly connected with proper waste management. This approach must begin with the prevention of waste generation . Return of the waste generated during production, at the beginning of the manufacturing chain, leads to the reduction of raw material demand. Energy recovery from waste can also be an interesting option in waste management systems. Thermal treatment and mechanical-biological waste treatment are used as technologies for energy recovery . Moreover, recycling and energy recovery reduce the amount of waste disposal in the landfills. Organic recycling of (bio)degradable materials under industrial composting conditions has one more important advantage which leads to an increase in the amount of organic feedstock. The use of biodegradable food service ware at public events such as concerts and festivals results in a collection of large quantities of compostable material. Proper preparation of the infrastructure requires the dedication of substantial efforts regarding the development of industrial composting facilities in many countries. First European Climate Change Programme (ECCP I) launched June 2000. European Union Directive 94/62/EC defines organic recycling as composting (aerobic treatment) or biogasification (anaerobic treatment) [26, 31]. In 2005 the European Commission, based on information obtained from member states, reported that there are large differences in the roles given to composting among countries. There are various differences in the definition of the concept of composting, that is, whether or not it is waste. Some countries have the relevant legislation concerning this case; in others, this decision is at the discretion of the regulatory authorities. There are also countries in which compost is not considered waste when registered as a product. Compost quality certification includes specifications for compost as a product that fulfills the requirements as an organic fertilizer or an organic soil improver. Regulations and standards may also concern the input materials that are used in compost production. In many countries, there is a list of permitted materials; if the material is not included, it is not permitted to be used it in the composting process . Canadian BNQ – 9011-911/2007 Compostable plastic bags. JBPA (Japan BioPlastics Association, Japan). The certificate can only be applied to a finished product. Products made of compostable materials that received the certificate must be strictly defined. If, for example, the packaging thickness is increased, the product will need to be tested again . Once a year, the product that received the certification must pass verification tests. A certificate is given for a period of 3 years. The certification of bioplastics is important and prevents the creation of misleading and false statements . Not only information, but also society’s education is very important during the introduction of compostable packaging onto the market. The pilot project for the marketing and recycling of packaging made from (bio)degradable polymers was conducted in Kassel in Germany by the industry and by the Federal Ministry of Consumer Protection, Food, and Agriculture . Public awareness of the importance of the quality of the environment stimulates attempts to provide safer polymeric materials and their degradation products. However, the possibility of the production of highly pure compost depends on knowledge on the composting process and compost composition, including the level of undesirable materials (contaminants) such as glass, plastic, and other compounds: heavy metals and organic contaminants. For this reason, the basis of the composting processes and the methods of evaluating the composting process and the biodegradability of polymers are so important. Evaluation of the composting process consists of several stages, in which three basic processes should be taken into account: biodegradation, disintegration, and ecotoxicity tests (Fig. 6). First, the material characteristics are needed, which should contain the determination of the chemical composition, the content of organic contaminants, and the heavy metals that are hazardous for the environment . Also, the products of the biodegradation process cannot adversely affect the quality of the resulting compost. The content of the toxic components of the tested material or the possibility of their occurrence during biodegradation disqualifies the material from being biodegradable. The composting process depends on many factors, not only on the conditions and place of processing (often no correlation between laboratory tests and those carried out under real conditions owing to the influence of environmental factors and a temperature profile), but also on the dimensions, thickness, and shape of the sample in addition to its thermal and processing history [42, 43, 44, 45]. For this reason, it is very difficult to compare the results of polymer degradation obtained under different test conditions, even with regard to the chemical structure of the material. However, there are several commonly used methods for determining the progress of the composting process of plastic materials [46, 47]. During the aerobic biodegradation process, the decomposition of the material studied leads to the formation of carbon dioxide, water, and biomass, which in turn result in the reduction of the sample mass . Thus, the progress of the process can be measured by sample mass loss or by determination of carbon dioxide production designated by a conventional technique such as the titration method (TM) and gas chromatography analysis, or by using the respirometry technique [49, 50, 51, 52]. Sometimes, the disintegration of the material into smaller pieces makes it difficult to separate polymer from the environment and accurate weighing. When the polymer after the composting process is dissolved in a specific solvent, molar mass changes due to the hydrolysis process can be determined by, for example, gel permeation chromatography (GPC) analysis. Furthermore, the progress of the composting process can be determined by changes in the chemical structure (spectroscopic methods such as Fourier transform infrared spectroscopy; FTIR) and morphology of the material tested (microscopic methods). These include inter alia optical microscopy, scanning electron microscopy (SEM), and atomic force microscopy (AFM). The microscopic techniques provide an opportunity to observe materials from the micro- to the nanoscale, which allows the estimation of heterogeneity and/or surface roughness and the defects (pores, holes) forming in the polymer subjected to biodegradation. During the biodegradation process, the variation in the properties of crystallinity or mechanical and thermal properties were also determined by differential scanning calorimetry (DSC) and thermogravimetric analysis (TGA) [50, 53, 54, 55, 56, 57, 58]. where: mCO2test and mCO2blank are the amount of CO2 evolved from tested material and blank respectively . where: m is the mass of tested material sample [g], 44 and 12 are the molar mass of CO2 and atomic mass of carbon [g/mol] respectively. The respirometric studies under controlled composting conditions on a laboratory-scale or testing on a pilot-scale are conducted according to the existing international standards [59, 60, 61, 62, 63, 64]. The differences among the studies concern both the construction and the operating principles of the respirometer in addition to the test conditions and intended purpose of the results. For example, during respirometric tests, the oxygen absorption in manometric respirometers, e.g., the OxiTop® system with a pressure sensor and production of CO2 measured by TM or with use an automatic respirometer e.g., Micro-Oxymax, is measured (Fig. 7) [65, 66, 67]. Methods based on oxide consumption can be carried out as a static process without oxygen aeration and in the continuous oxygen supply flow (dynamic measurements) [68, 69]. 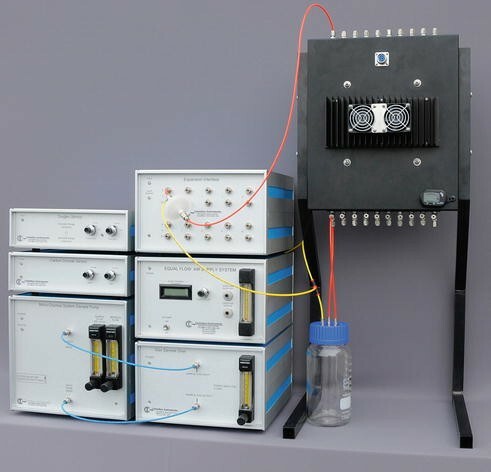 Comparative studies have been conducted in two types of systems: first with a Costech dynamic respirometer, which is an adiabatic reactor with a capacity of up to 30 L measuring in a continuous way the oxygen concentration, temperature, and air flow, and a second system with the AIR-nl respirometer, which is also an adiabatic reactor, but is equipped with a heating jacket to maintain a constant medium temperature (30 °C). The results obtained indicate the need to develop an appropriate analytical model separately for static studies and for those conducted in dynamic mode . In the electrolytic respirometer such as Sapromat®, oxygen absorption in the sample chamber is measured by monitoring the pressure drop causing electrolysis of the respective solutions, which in turn leads to the replenishment of the oxygen consumed [71, 72, 73]. Evaluation of the biodegradation, in particular, the samples’ compostability based on the measurement of the oxygen uptake rate inside the material (OURinsitu) showed the real activity of the composting process . The Lancaster University method of measuring 14CO2 released from 14C-labelled substrates, which allows tracking of a particular material subjected to conducted biodegradation process in the system is used . Depending on the analyzed samples, respirometers can work in the compost solid, aqueous solutions, or mixed systems. Important aspects of the respirometric measurements are pH and particularly its impact on the production of CO2 and CO2 solubility in aqueous solutions, in addition to humidity and the type of microorganisms along with porosity and contamination of the material tested. For instance, the pH of the organic fraction of municipal solid wastes is often near acidic conditions (pH = 5.5–6.5), whereas the pH of sewage sludge is within the alkaline range (pH = 7.5–8.5) . Thus, a difference of 2–3 units in the pH value of two different residues may not permit a comparison between respiration results. It is therefore necessary to emphasize very strongly that only the use of the complementary analytical methods allows not only the correct term course of the process of biodegradation for a particular material, but more importantly gives the possibility of predicting the lifetime of polymer materials and their behavior during use. This fits to a research area of forensic engineering of advanced polymeric materials, which investigates relationships among the structure, properties, and behavior of advanced polymeric materials before, during, and after use [33, 44, 77, 78, 79]. The last point in the evaluation of the composting process, but no less important, is the ecotoxicity testing methods. Investigation results of sewage sludge samples from Spanish wastewater treatment plants tested using the Microtox® toxicity test with Vibrio fischeri and the root elongation test with Allium cepa, Lolium perenne, and Raphanus sativus seeds showed that in aerobic composting, for better stability and lower ecotoxicity of the compost, the fermented material should be used . 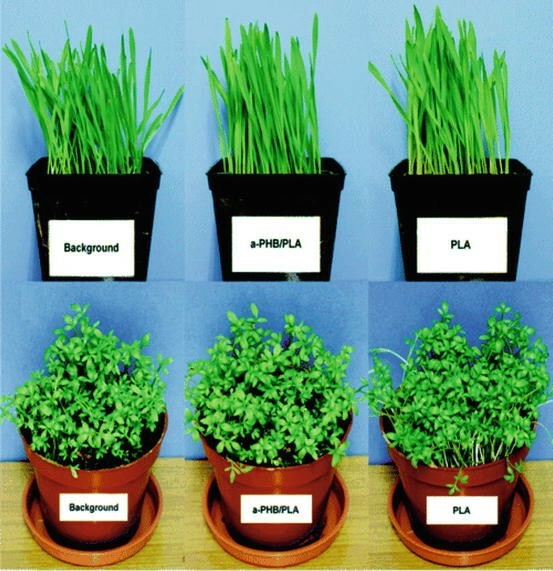 The plant growth test in accordance with OECD 208  was carried out for cress (Lepidium sativum) and barley (Hordeum vulgare) with the purpose of checking the ecotoxicity of soil degradation products of polylactide (PLA) and its blend with poly[(R,S)-3-hydroxybutyrate] (aPHB) . A similar test was performed for an aliphatic-aromatic copolyester of poly(butylene adipate-co-terephthalate) (PBAT) . In both cases, the lack of inhibitory effects in the investigated plants was observed; thus, the degradation products of the polyester studied are harmless to the plants tested (Fig. 8). Organic waste from agriculture, management of urban greenery, and households are a considerable burden for the environment. The landfill disposal of organic waste leads to the generation of the potent greenhouse gas methane and the production of the pollutant leachate. However, this type of waste may be used as an important source of nutrient for crops, especially fruits and vegetables. The controlled decomposition of organic matter and obtaining rich soil from it is called composting. This process occurs in nature, but it can be accelerated in special industrial composting systems . Decomposition means the complete breakdown of organic matter. A specific part of this process is mineralization. Mineralization (the effect of the activity of microorganisms) is a process in which organic matter decomposes, releasing carbon as the CO2 and nutrients in inorganic form, in which plants can use them. As a result of the activity of microorganisms, enzymes such as nitrogenase are secreted to catalyze the breakdown (or digestion) of the organic material (extracellular digestion) to form humus. Mineralization occurs when compost has a carbon-to-nitrogen ratio (C:N) lower than 20:1 and N concentration greater than 1.6% [85, 86]. In industrial composting, the main goal is to receive humus that is safe, rich in organic matter, and that can be sold. This is why it is important to provide the appropriate process conditions. In the first phase (about 21 days), the thermophilic microorganisms grow on the waste, using it as a carbon source. This process causes the release of energy in the form of heat, which leads to the elimination of pathogenic microorganisms (hygienization) and weed seeds . The thermophilic phase in which the temperature is maintained between 50 °C and 70 °C for 3 weeks, compost hygienization is ensured and the compost can be considered microbiologically safe. In the next phase (curing/maturation), the temperature gradually decreases and mature compost (humic substances) is obtained . Composting technologies are very diverse and dependent on the technologies used, for example, composting process taking place in open or closed systems, in piles, in a container, or in a tunnel with aeration or a lack thereof. The simplest technique is use of an outdoor pile. Plants that use this technique is do not apply artificial aeration or drainage of waste gases. Techniques that use aeration usually are connected with the capture and purification of waste gases, in a combined system of scrubbers and biofilters. Before, during or after the composting process segregation should be carried out to separate undesirable components [88, 89]. The huge amount of organic waste needs a professional facility that ensures the proper conditions. Those facilities are organized in the large-scale composting plant. To receive good-quality compost, the composting processing parameters, such as material structure, moisture content, aeration, temperature, pH or C:N ratio must be optimized. Proper rigidity of the composting material allows to the porosity to be created and maintained during the composting process. Because the composting is an aerobic process and microbes need oxygen to live, the creation of a suitable pore size causes an optimal air flow. In the final stage of the composting process, appropriate humidity should be between 40% and 65%, and the optimal C:N ratio is 25:1 to 30:1, which limits the formation of bad odors . The duration of the composting process varies from a little over a week to several months, depending on the type of polymer, the technique of composting, and the maturity of the compost product . There are many industrial methods of composting, and new ideas are still being introduced. The most popular is an aerated static pile. There are two different type of air flow through the composting pile: positive (forcing) and negative (pulling). The compost may be placed on concrete slabs with holes that allow circulation without having to manipulate or turn the entire compost heap, and on the series of perforated pipes of suitable size. Material for composting may also be laid out in long windrows, which are periodically turned to provide an air flow . The composting pile requires the correct composition of raw materials. A successful recipe must take into account the current state of waste deposited from the waste provider and the humidity, structure, and density of each ingredient (leaves, tree branches, grass, sewage sludge, spoiled fruit, vegetables, etc.). Aerated static composting piles are also used in the second phase of composting (curing/maturation) . Simple modification of the turned windrow composting system by the placing of the composted material between two long, parallel concrete walls enabled more efficient use of the space. A specialized turning machine is used to move the materials down the length of the channel . In-vessel composting systems are the new approach to this process for the industrial condition. Closed composting technologies are more flexible for the various waste type and volume. In that type of composting system, the reduction of the environmental impact is the main goal. The aeration systems allow the reversal and recirculation of air in the system and the generated gases are released to the atmosphere through a biological filter. The problem of a condensate (leachate) has been solved by the collection and neutralization systems. The closed systems are fully or partly automated, and this solution ensures the correct process conditions. All of these features significantly reduces the duration of the composting process . The modular composting system consists of portable containers. If necessary, it is possible to connect another individual container to increase the volume of this composting system. During the process, the containers are connected to a biomass aeration system and water circulates in a closed cycle . Developments in industrial composting systems, especially in closed ones, allow the organic component of mixed municipal waste to biodegrade. BIODEGMA and the rotating drum system are composting systems in which different types of organic waste can be composted . In the BIODEGMA system, the expanded polytetrafluoroethylene (ePTFE) membrane is used in the semipermeable laminate for roofing. The use of such a solution gives an opportunity for the withdrawal of the biofilter, because scent molecules are trapped by the water accumulating on the bottom side of the laminate . In the drums systems, the rotated containers for composting are positioned on a slight incline, which enables the displacement of injected material from the upper end to the lower end, where it is removed . Most installations produce compost based on the biodegradable fraction of municipal solid waste (MSW). MSW is waste from private households and from other facilities that is collected together . The composition of MSW is different in various European cities and countries, but always contains a significant amount of biological material (municipal bio-waste). Depending on the country, the kitchen waste and green waste from gardens and parks account for 30–50% of the total MSW. According to Directive 2008/98/EC, the bio-waste is defined as biodegradable garden and park waste, food and kitchen waste from households, restaurants, dining and retail outlets, in addition to comparable waste from food-processing plants. Kitchen waste consists mainly of food remains. The paper fraction of the MSW is composed largely of processed biological material, similar to the textile waste from natural fibers. Recently developed are technologies that enable the production of pure compost from the mixed organic fraction of MSW, by using an enhanced segregation of the material before and during the composting process. The other types of compost could be obtained from the bark, manure, and sewage sludge (with the addition of filling materials) . Biodegradable waste can also be broken down in a controlled process, in the absence of oxygen – either independently or in combination with the aerobic composting. The anaerobic process takes place in sealed containers and usually lasts a few weeks, making the product rich in biogas (with 45–80% methane content). The biogas is predominantly burned to produce electricity and/or heat. Part of the energy may be used to heat the process and maintain the required temperature (30–60 °C). Optionally, the biogas may be purified and in the form of pure methane used as a fuel. Moreover, in the process of anaerobic digestion fermented material, also called digestate material, is produced as a residual product of liquid or sludge consistency. This digestate can be used on agricultural land as an organic fertilizer. In addition to reducing greenhouse gas emissions, use of the digestate material as biofertilizer instead of unprocessed manure brings environmental benefits such as lower levels of odor, increased veterinary safety, and reducing the amount of plant pathogens and weed seeds. Anaerobic digestion is used in the case of a biodegradable fraction of MSW, agricultural waste (manure, waste, straw, beet leaves, and potatoes), waste from food industries (leftovers from brewing, pressing the grapes, sugar production, by-products from the slaughterhouse, leftovers from meat processing, waste water from the processing of milk, and sewage sludge) . Simultaneously, the use of compost in agriculture as an organic fertilizer or soil conditioner entails a variety of environmental implications. In this case, the chemical compounds contained in compost (especially heavy metals and organic contaminants), after penetrating the soil, can have a negative effect on plants and through the food chain on people. What happens with the heavy metals depends on a number of factors such as the characteristics and the type of the crops, pH of the soil, the possibility of these metals penetration the groundwater, consumption by plants and as consequence of these, their presence in the food chain. Repeated application of compost to the soil can lead to accumulation of heavy metals whose long-term effects are not fully understood. Some metals, such as zinc, copper, and nickel are trace elements and play an important role in the growth of plants, if present in small quantity . The organic contaminants can be put into compost along with waste material and, to a certain extent, generated by the composting process itself. Moreover, their degradation, leading to changes in the composition of the organic contaminants, may also occur. However, during composting, persistent organic pollutants that are significant from the ecotoxicological point of view are almost never removed, if contained in the soil. It has been shown, for example, that certain polycyclic aromatic hydrocarbons almost do not decompose during composting and remain in the soil. The complexity of the problem is increased by insufficient knowledge of the properties and features of the soil and the interaction between the soil and compost and its components. Nevertheless, it is widely believed that the quality compost provided containing relatively small quantities of organic contaminants applied according to good agricultural practice allows long-term benefits to be achieved for the soil-plant system that are much greater than the risks and potentially negative effects . Although bio-based recyclable and/or (bio)degradable plastics have grown in importance in sectors such as medical, agriculture, horticulture, packaging, automotive, building, food-services, and consumer goods in recent years, other high-demand sectors with more durable applications such as textiles, electronics, building and construction, and automotive parts still have a limited use for these types of ecomaterials. Construction and transportation (ground transportation and aerospace) sectors in addition to high-value industrial sectors in the European economy, such as electronics or household goods, need recyclable and/or biodegradable materials to produce new ecofriendly plastics with excellent structural and functional properties, while increasing the sustainability. Such materials significantly improve the competitiveness of European companies in different sectors such as chemical, biopolymer producers, processing companies, and many others [5, 99, 100]. The production chain clearly contributes to a cooperative economy combining intermediate sectors not previously linked, such as the agriculture and agro-food sectors, suppliers of feedstocks (industrial crops and biomass in addition to waste) to the chemistry sector of bio-based polymers for high-added value products (usually with low-volume biopolymers, second-generation biofuels, fibers, etc.) in advanced production chains . The development of bio-based polymers with advanced functionalities for demanding sectors such as the automotive or construction sector, which require polymers for lightweight plastics and composites with excellent structural properties, is now a leading trend in the European Union . The global production capacity of bio-based plastics is 4,160,000 tonnes. Figure 9 shows global production capacity divided into individual sectors of bio-based plastics . The driving force for increasing the production of ecomaterials, which can be bio-based and/or biodegradable, is the reduction of oil reserves and its price fluctuations, environmental pollution, and consumer preference for environmentally friendly products, carbon footprint, toxicity issues, and government policies for green and renewable resources . Bio-based and/or (bio)degradable plastics have found their use in various commercial applications and scientists are constantly working on new ones. The largest market for polymer ecomaterials is the packaging industry. However, products with the most negative environmental impact still come from the food sector, which is closely linked to the packaging industry; thus, it is important to continue striving for the wider use of biomaterials. Natural polymers and polymers from renewable sources seem to be good alternatives to conventional plastics used in food packaging as biodegradable or edible films and coatings . Starch, because it is readily available in large quantities at a relatively low price, is considered to be one of the best candidates for the production of biodegradable food packaging. Starches have very attractive physical properties, such as barrierity (low permeability of gases, and the addition of hydrophobic components and water), optical (transparency or ability to impart the desired color), and rheological properties. Starch polymers can be used with practically no restrictions, and the interest in their uses, in world markets, is growing continuously. Thermoplastic starch (TPS) is used for food wrappings and cups, plates, and other food containers . The mixture of starch and glycerol after the gelatinization process, owing to the hydroscopic properties of the material, is not suitable for the packaging of high-moisture and liquid food products. Polymer/starch composites based on PLA, poly(ε-caprolactone) (PCL) or poly(vinyl alcohol) (PVA) is used for the production of flexible and rigid films, thermoformed into rigid injection-molded packaging trays, and for the coating of paper and cardboard . Cellulose and its derivatives, chitosan and its blends with PCL, proteins such as zein, gluten, soy protein, and whey protein, are also used as packaging materials [106, 107, 108]. For example, cellulose acetate is widely used in food packaging for fresh products and baked goods . One of the commonly used (bio)degradable polymers – PLA – is used in the production of beverage bottles, transparent rigid containers, bags, jars, food containers, and disposable cups, coating for all types of packaging, packaging bags, household refuse bags, and film packaging foams. These polymers can be blended with poly(ethylene oxide), poly(ethylene glycol), PCL, poly(vinyl acetate), poly(3-hydroxybutyrate) (PHB), cellulose acetate, poly(butylene succinate) (PBS), and poly(hexamethylene succinate), or with plasticizers such as oligolactide, glycerol, triacetin, and low molar mass citrates [110, 111, 112, 113]. The choice of plasticizers or polymers depends on the application of the materials. For food packaging, selected additives must not be toxic . (Bio)degradable material based on PLA and poly(3-hydroxybutyrate-co-3-hydroxyvalerate) (PHBV) has shown effective application for the production of thermoformed containers for food packaging. Polyhydroxyalkanoates (PHAs) such as PHB and its copolymers PHBV, poly(hydroxybutyrate-co-hydroxyhexanoate) (PHBHx), poly(hydroxybutyrate-co-hydroxyoctanoate) (PHBO), poly(hydroxybutyrate-co-hydroxyoctadecanoate) (PHBOd), and poly(3-hydroxybutyrate-co-4-hydroxybutyrate) (P3HB4HB) can be used in packaging for deep drawing articles in the food industry such as bottles, one-way cups, laminated foils, fishnets, and fast food containers [115, 116]. The automotive industry is focused on reducing fuel consumption and CO2 emissions by, for example, reducing vehicle mass. This approach could be a great opportunity to expand the bio-based and/or (bio)degradable polymer applications. Leading worldwide automotive brands have already successfully used bio-based plastics, such as bio-based polyamides and polyesters, to reduce their environmental impact. Bio-based polymers, such as coatings for interiors or exteriors, thermoplastic elastomers, fiber reinforced thermosetting, shape memory and self-healing polymers, piezoresistive components for interior trim prototypes, and for strain gauges for vibration monitoring, possess all the properties important for the high-quality components of vehicles . Composites are one of the most commonly used ecomaterials because of their good mechanical properties and the relative ease of combination with other materials . In the automotive industry, bio-based polymer composites, but only those that can be recycled, can be used in structural parts of the vehicle’s body such as the door handle, dashboard fascia, panels, floor trim, scooter frames, secondary paneling or interiors and under the bonnet. The plastic content in commercial vehicles comprises about 50% of all interior components, including safety subsystems and door and seat assemblies. Research and development of new materials, including (bio)degradable plastics with well-defined properties, from both a service and an environmental point of view, have shown continuous progress . PLA matrix composites with kenaf fiber or cordenka could be used as spare tire covers or circuit boards . Three-dimensional (3D) printing is a rapidly growing additive manufacturing technology that is a promising integral tool in the design process and for obtaining products from ecomaterials, especially in industrial sectors, such as construction, automotive, and transportation sectors, including aviation and aerospace. 3D printing technologies allow the more efficient building of concept cars and aircrafts compared with traditional methods. 3D models are used from concept creation to production planning, allowing engineers to accelerate and improve the development process in accordance with the concept of sustainable development. However, this technology can also be used not only for rapid prototyping, but for industrial production as well, particularly for luxury goods or devices of high-added value, such as luxury or antique cars. The market for materials used in 3D printing is growing very fast, which also implies an increase in the bio-based and/or (bio)degradable polymer market, and in the use of such polymers as PLA, PCL or PHAs . The building and construction sector, similar to the automotive industry, is focused on reducing CO2 emissions. Green ecofriendly buildings are supposed to be healthy places to live and work. Conventional ecofriendly building materials include laminated wood plastic components, polymerized waterproof compounds, polymer compositions (polyesters with jute fibers or fiber-reinforced polymers). Bio-based and/or (bio)degradable plastics can be used as molds for truss joints, high thermal insulation rigid foams, new mortars or concretes containing waste, bio-based polyurethane foams, and piezoresistive strain gauges for monitoring mechanical deformations of structures . For example, PLA-based composites could be used as internal window profiles or together with aluminum hypophosphite as flame-retardant materials . Composites are classified with regard to their applications as structural constructions including bridges and roof structures in addition to nonstructural constructions such as windows, exterior constructions, composite panels, and door frames. At present, composite ecomaterials are also considered one of the main ecofriendly materials. Proper selection of bio-based and/or (bio)degradable polymer matrix with appropriate processing can result in optimal properties for many applications in fields such as building and construction, but also in food science, nutrition and packaging, biomedical engineering, medicine, etc. [120, 123]. The textile sector is the world’s oldest consumer goods industry and the world’s second-largest economic activity. Textile products are the fourth category of products that have the greatest environmental impact after food, transport, and construction. The textiles (production process and generated waste after life cycle) are responsible for 2% to 10% of the environmental impact of EU States, which increases concern about the environmental impacts of textiles . Environmental issues in the textile industry are very diverse and depend on the type of fibers used for production (natural such as cotton, wool, flax, silk versus manmade or synthetic polymers), and the type of production process (wet versus dry). For this reason, work is under way replacing traditional polymer fibers with new ecofriendly materials, such as PLA . The way to address the problems of textile waste and CO2 reduction is to use recycled materials and apply 3D printing to the design and manufacturing of clothing . WillowFlex is a new biodegradable material that is used in 3D printers. It has a number of unique features; primarily, it is made of compostable materials and is flexible. Its main ingredient is maize corn starch that has not been genetically modified. This material was used by fashion designer Babette Sperling to produce clothes using 3D printing . Also, a new approach to the development of high-performance materials, such as ecofriendly fibrous composite materials and technical textiles, is realized by a systematic biomimetic approach that helps to understand the biological structures, processes, and functionality (biologically inspired ideas) that can be used to produce novel biomimetic microcomposites for the textile sector, including biogeotextiles and nonwoven textiles . (Bio)degradable polymers have found extensive use in the consumer goods sector that relate to products purchased by individuals. This sector covers various areas of human activity such as furniture, suitcases, grinding discs, safety helmets. Commonly used in this sector are a variety of natural and bio-based composites and blends such as cellulose fiber/PLA composites . Polymer materials are currently used for the production of adhesives, paints, engine lubricants, and construction materials . Biodegradable golf tees and fishing hooks have also been developed . Moreover, chemically modified plant cellulose (e.g., cellulose acetate) is used in the production of toothbrush handles and adhesive tape backing . Furthermore, starch-based materials are finding their way into new markets, such as coffee capsules. WillowFlex material is currently in the testing phase for use in the manufacturing of toys by 3D printing . Another material used to produce biodegradable toys (such as Lego-like blocks, plastic balls, and various toy models, pens, art knives) is SEPPA. This is a biodegradable material produced from marine shell by Chieng Roung Industry (Taichung City, Taiwan) . At this time, in agriculture and horticulture, natural and synthetic (bio)degradable polymers, such as agar, pectin, starch, alginate, cellulose and its derivatives, have particular significance, along with PLA, PCL, and PVA . The (bio)degradable polymers are being utilized in agricultural applications such as soil retention sheeting, agricultural film, plant pots, seed tape or fertilizer tape and binding materials, and fishing lines and nets . The use of (bio)degradable film is practical and offers economic benefits because the foils with (bio)degradable polymers do not have to be removed from the soil after they are used. An example of this is biodegradable mulch made from plant starch and currently available on the market. The starch, because of its poor mechanical properties such as brittleness must be blended with other polymers. Mulch film BioBags is marketed under the name BioAgri and is manufactured from Mater-Bi®, a biodegradable raw material formed by complexing starch with polyester. BioAgri is compostable and biodegradable in soil in 1–24 months, depending on the climate and temperatures. Mulch film can be used as a mulch soil cover to inhibit weed growth and retain the soil’s moisture. Other commercially available products containing plant starch that are used in agriculture and horticulture include materials such as Biomax TPS (DuPont, St Joseph, MO, USA), Biopar (Biop, Munich, Germany), Paragon (Avebe, Foxhol, Netherlands), Biosafe™ (Xinfu Pharmaceutical Co., Hangzhou, China), Eastar Bio™ (Novamont, Novara, Italy), Ingeo® (NatureWorks, Minnetonka, MN, USA), and Mater-Bi® (Novamont). Other polymers used to produce biodegradable agriculture product are PBS, known as Bionolle® (Showa High Polymer, Tokyo, Japan) or PBAT, known as Ecoflex® (BASF, Germany). The next class of products is nano- and microparticles, pesticide-polymer conjugates, nanocomposites, matrix-based systems, etc., for controlled pesticide and herbicide release from (bio)degradable polymers. Natural polymers such as agar, pectin, starch, alginate, and cellulose derivatives, along with synthetic (bio)degradable polymers such as PCL, PLA, and PVA, can be used as carriers for pesticides . New nondisposable applications, such as mobile phone casings or electroconductive plastics, were developed to create electronic items from sustainable resources. Composite ecomaterials based on hollow keratin fibers and chemically modified soybean oil find applications in electronics as new low dielectric constant materials. Other electronic devices that use polymer-based ecomaterials include capacitors, communication devices, loudspeakers with advanced functionalities, and paper-based displays made from wood lignocellulose microfiber-based polymers or batteries for microelectromechanical systems. By spinning different nanofibers individually or by hybridizing with other materials and incorporating them into a suitable bio-based polymer, nanobiocomposites can be produced as possible superior structural components (lighter than their microcounterparts) for use in a variety of sectors such as electrical, optical, and biomedical as components for various functional devices. Ecofriendly composites can also be used as covers and parts in vacuum cleaners, power tool housings and for portable electronic equipment such as mobile phones. The electronics industry also uses (bio)degradable materials such as PLA/cordenka composites . PLA can also be functionalized with various additives or enhanced by special technology to achieve properties such as conductivity, significant improvement in thermal stability or mechanical properties, and they are suitable for 3D printing technology, providing almost unlimited possibilities in the production of ready-to-use electronic ecomaterials . The use of (bio)degradable polymers is extensive and fast expanding in the medical and dental fields because of their (bio)degradability, which allows them to be absorbed by the human body. Some of the applications include the production of medical and dental devices, wound sutures and staples, (bio)degradable plastic screws and rods for pinning and repairing ligaments, devices for internal drug deposition, orthopedic moldings, cardiovascular and intestinal supports, polymer tissues, sponges, and moldings. Sutures are the major area in which the application of (bio)degradable polymers is particularly appropriate in both the braided and the monofilament variety. Polymers such as polyglycolide (PGA), PLA, poly(lactide-co-glycolide) (PLGA), poly(p-dioxanone), PCL, poly[glycolide-co-(ε-caprolactone)], and block copolymers of trimethylene carbonate and glycolide are used as materials for sutures . The selection of sutures is based on criteria appropriate to the surgical procedures and special care must be exercised when selecting sutures for ophthalmic, neurological, and cardiovascular procedures based on the risk/benefit analysis of each type of suture. For dental devices, two applications are particularly appropriate for (bio)degradable polymers: as void filler following tooth extraction (porous polymer particles can be packed into the cavity to promote quicker healing); also, films of (bio)degradable polymer can be positioned to exclude epithelial migration following periodontal surgery (guided-tissue-regeneration membrane). The field of orthopedics is growing at a robust rate globally and accounts for a wide range of surgical applications including joint replacement, fracture fixation plates, bone defect fillers, bone cement, and artificial orthopedic constructs . In the field of orthopedics, titanium and other metals, traditionally used for the repair of fractures, are being replaced by polymer devices. Polymer implants transfer stress to the damaged area, over time, allowing healing of the tissue, and they eliminate the need for follow-up surgery to remove a metal implant. This shortens the total treatment time of the patient, and eliminates risks associated with additional surgery. (Bio)degradable polymers such as PCL and its composites, PGA, PLA, PLGA, PHB, PHBV, poly(propylene carbonate) or PBS are used for other applications such as anastomosis rings and tissue staples, ligating clips, vascular grafts, stents, and tissue engineering scaffolds [136, 137]. For example, PHB has been used as a surgical implant, in surgery, as seam threads for the healing of wounds and blood vessels, and PCL has been in tissue engineering scaffolds for the regeneration of nerve, bone, skin, and vascular tissues [138, 139]. There are a number of promising polymers whose properties are being investigated for potential application in medical fields, including scaffold materials that mimic the 3D structure of native tissue . The next class of products is (bio)degradable polymers for site-specific drug delivery, either as a coating on a medical device or as a device, both fully biodegradable (for example, the PolyActive or OctoDEX systems). Some of the most widely used (bio)degradable polymers for drug delivery applications are thermoplastic aliphatic polyesters such as PLA, PGA, PHB, and especially the PLGA copolymer or natural polymers such as chitosan, starch, and soy protein [141, 142, 143, 144, 145]. Ecomaterials are not only polymers that can be easily disposed of and recycled (biodegradable, compostable) and/or from renewable sources, but also polymers that may have special properties that enhance environmental improvement, such as polymers for efficiency (waste reduction polymers), polymers for waste treatment (membranes, ion-exchange resin, absorbents), polymers for the reduction of the environmental load (catalyst and membranes for fuel cells, photo-catalyst coating materials), hazardous free polymers, polymers that reduce the impact on human health, polymers for energy efficiency, and materials for green energy . It would be ideal to combine these special properties with biodegradability. The (bio)degradable plastics market is relatively new, but it involves an increasing number of products that have so far been obtained from conventional nonbiodegradable polymers. Growth in the use of (bio)degradable polymers is associated with an increase in society’s ecological awareness and shifts preferences toward environmentally friendly products, the tendency to use renewable raw materials, and the positive attitude of the government toward green policy. The largest sector in the (bio)degradable plastics market is packaging, in particular food packaging, then textile fibers, agriculture, injection molding, etc. Biodegradable packaging provides natural, easily degradable product protection, becoming an integral part of the global packaging market. The (bio)degradable plastics market is divided in terms of volume into PLA, starch blends, PCL, regenerated cellulose, PBS, and PHAs. PLA is the largest segment of the entire (bio)degradable plastics market and is expected to grow at the second fastest rate because of its excellent mechanical properties and ease of processing. In terms of value, starch blends have the largest market share, as a result of the high cost of starch blends compared with PLA [146, 147, 148]. The potential of compostable polymer materials and their commercial success depends on price reduction, an increase in the cost of fossil resources and market demand, productivity, development of composting infrastructures and legislation, process optimization, and scaling up supported by full life cycle assessment analysis and ever-increasing ecological awareness . Still, biodegradable and compostable products are commonly used mainly in the institutional and commercial sectors, such as the food service sector, and these sectors will develop the (bio)degradable polymers market in the coming years, which is already a significant market force. On the other hand, rapidly growing three-dimensional printing technology and the demand for new “inks” could open up a new field within this area of technology, and implies an increase in the (bio)degradable polymer market.